2018 Dodge Charger GT Review | Orchard Chrysler Dodge Jeep Ram " "
The 2018 Dodge Charger is a popular sedan that offers a sporty driving experience with a family-friendly four-door design. It’s even been named one of Strategic Vision’s “Most Loved Vehicles in America”. No doubt, it’s a vehicle that’s attractive to a wide range of car shoppers. But when you want a sedan that’s more performance-oriented than the rest, where do you look? That’s when you look for the Dodge Charger GT. It’s packed with unique features and equipment. And of course, thrilling performance without stepping up to a V8 engine. You’ll find the 2018 Dodge Charger for sale in Washington, MI at Orchard Chrysler Dodge Jeep Ram. You don’t get assigned the GT trim level without the expectation of performance. For the Dodge Charger GT, the 3.6-liter Pentastar V6 and an 8-speed TorqueFlite automatic transmission are the powertrain of choice. With 300 horsepower, it’s a bit of a surprise that the Dodge Charger GT achieves an EPA-estimated 27 miles per gallon. But what about Front Axle Disconnect? 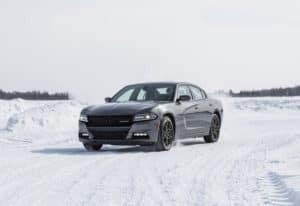 The Dodge Charger GT has an active transfer case and front axle disconnect so the front wheels are powered only when it’s needed. It’s one of the ways the Charger GT can achieve such great fuel economy. You want to stay connected, even while you drive. Your 2018 Dodge Charger GT can do that for you with its standard-equipment Uconnect 8.4 infotainment system. It features an 8.4-inch capacitive touchscreen that mimics how a smartphone operates. Apple CarPlay and Android Auto are standard equipment, as is Bluetooth phone connectivity and audio streaming and navigation. Want to keep track of how your Charger’s been performing? With Dodge Performance Pages, you’ll get all the information you want – and more – directly on your Uconnect 8.4 screen. Info you can view includes real-time stats, from engine performance to the actual exerted g-force of your vehicle. And with Dodge Performance Pages, you can control your Charger’s Launch Control function. How cool is that? With Advanced All-Wheel Drive, your car has different suspension requirements based on its performance abilities. 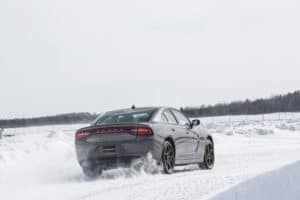 The 2018 Dodge Charger has unique AWD suspension tuning for the optimum control when accelerating, cornering, maneuvering, and braking. When you choose the 2018 Dodge Charger GT, it gets the GT appearance. A three-piece rear spoiler is standard equipment on the GT trim, emphasizing its athletic abilities and adding to the ‘wow’ factor. It’s finished in the matching body color for a seamless visual effect. The standard wheel fitted to the 2018 Dodge Charger GT is a 19-inch Granite Crystal painted aluminum wheel. Not only does it look great, but the larger wheel and low-profile tires add to its crisp handling. And the sinister dark finish tells people not to mess with you at the line either. The 2018 Dodge Charger comes in several trims, and you’re going to love the Dodge Charger GT. You’ll find your new Dodge Charger for sale in Washington, MI at your local dealer, Orchard Chrysler Dodge Jeep Ram.